(Gallica) A free flowering nearly thornless bush. Beautiful lilac and mauve flowers with a distinctive scent. (Hybrid Musk) One of the most beautiful roses in this group. A vigorous plant bearing large trusses of apricot yellow to buff-yellow flowers. These are of medium size and semi-double. Fragrant. Flowering from mid-summer onwards. (Modern Shrub) 'Xanthina spontanea'. One of the earliest roses to flower. Arching branches of bright yellow, single flowers with pronounced anthers. (Gallica) Rich, velvety purple flowers borne on a compact bush. Scented and clothed with healthy foliage. Almost thornless. 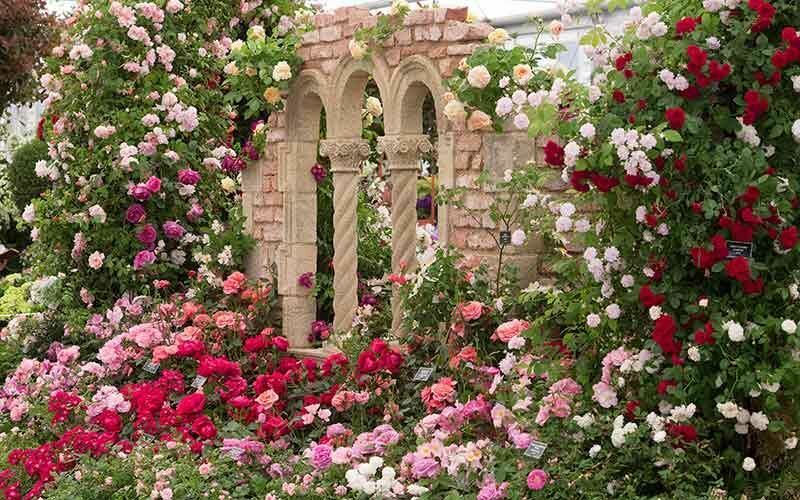 (China) 'Maltese Rose', 'Sweetheart Rose'. A free flowering delicate soft pink with small blooms of H.T. shape. Good for button holes. Low bushy growth. (Alba) 'Celeste'. Beautiful, soft pink, semi-double booms in contrast to the leaden foliage. An old variety of unkown origin. Deserves to be in every garden. (Damask) Clusters of semi-double, pink flowers with a heady perfume. Attractive grey foliage. (Modern Shrub) Gracefully arching branches of greyish foliage with clusters of pinkish-crimson flowers. Needs support in smaller gardens. Unique colouring and form combining a mixture of purples and deep reds. Very double. Interesting mid-green foliage. Of uncertain origin. (Modern Shrub) Large, shaggy, blush-pink fragrant flowers on an upright but bushy and healthy plant. (Portland) This rose is a perfect alternative to Gertrude Jekyll which we no longer stock. A vigorous, erect bush bearing very fragrant pinkish-lilac, full, flat flowers, borne continuously. Outstanding. Good foliage. (Modern Shrub) An outstanding June rose, vigorous, bearing sprays of large, pink, old fashioned blooms with a heavy myrrh-like scent. Needs some support. Grows well as a climber.